Daniel Shaffer reports: The picturesque spa town of Traunstein, deep in the Bavarian countryside close to Salzburg and the Austrian border, does not immediately spring to mind as the natural setting for an exhibition of Anatolian kilims, another of Turkish ceramics, and the annual meeting of the Munich-based Volkmann-Treffen. 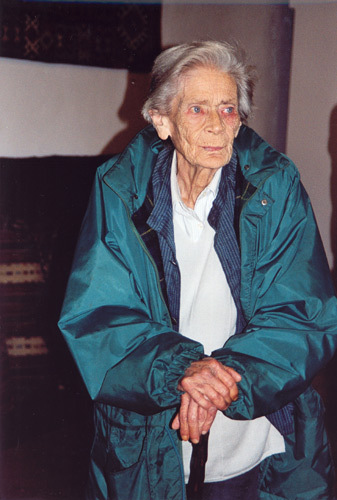 However, all three were to be found there in mid-October 2004. 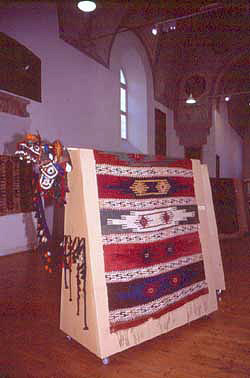 First the exhibitions: curated by the ubiquitous Harald Böhmer, 'Zelte, Kelim und Kamele - Nomaden in Anatolien' in the Kunstraum Klosterkirche Traunstein, included a range of kilims from German collections in addition to three tents and a wide range of associated nomadic paraphernalia. 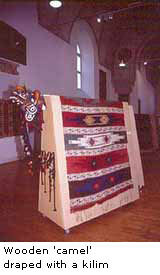 Only live camels were missing, their place taken by wooden forms over which kilims were draped as covers, as they might have been on migration in Anatolia. 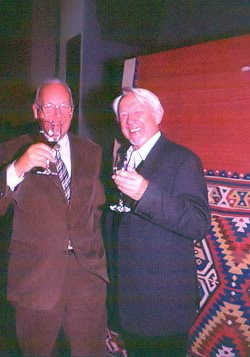 The display, from which 'artistic' fragments of ancient kilims were noticeably absent, reflected Dr Böhmer's main concerns by emphasising the functional ethnographic properties of the exhibits, rather than their artistry. The result was, in my view, not especially in tune with the ambience of the display space, a light, airy Bavarian baroque former Catholic church. 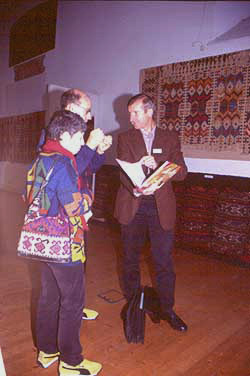 As such, this was in very marked contrast to the dramatic impact the last time a kilim exhibition was held in the same space in 2000 ('Form und Farbe', see HALI 112, p.143). Upstairs within the same complex of buildings was an excellent small exhibition of Iznik and other Turkish ceramics, as well as a handful of Ottoman embroideries and silk textiles familiar from Christian Erber's 1993 publication A Wealth of Silk and Velvet. The Treffen itself took place over a day and a half in what seemed to be the local council chamber. 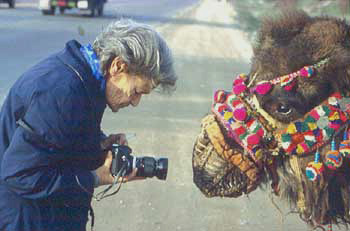 Dedicated to Josephine Powell, who had travelled from Istanbul for the event, and focused on aspects of tribal and nomadic life and textiles around the world, the programme began with a presentation of Powell's Anatolian field photographs chosen by her friend the botanist Dr Birgitte Jensen, who has been helping catalogue the Powell archive for many years. She was followed by Prof. Serife Atlihan of Marmara University and the DOBAG project on traditional textiles in the west Anatolian village of Camkalabak. The next lecture involved a change of continent, with Bobbie Sumberg from the Museum of International Folk Art in Santa Fe providing a thorough and interesting account of the development of Navajo weaving in the American Southwest. After lunch, it was back to Asia, this time India, with an account of the textiles made by the Rabari nomads of Gujarat given by Dr Eiluned Edwards of De Montfort University in Leicester, followed by the veteran former chief curator of textiles at the Ethnographic Museum in Basel, Dr Marie-Louise Nabholz, who discussed Baluch embroidery from Iran and Pakistan. The day ended with a fascinating lecture By Dr Matthijs de Keijzer from Amsterdam, who offered the audience an account of the other side of the natural dyeing coin - the development and introduction of synthetic dyes in oriental textiles. And lastly came a time-abbreviated lecture by Marcel and Annette Korolnik on aspects of nomadism in Morocco. 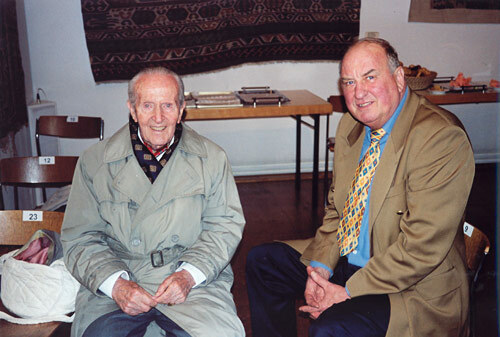 The highlight of the following morning, introduced by Dr Nabholz, was a showing of the now famous film Grass, made in 1924 by Merian Cooper and Ernest Shoedsack, with its scarcely believable graphic documentary of the seasonal migration by the bakhtiari tribe with their animals through the incredibly harsh landscape of the Zagros Mountains. The morning was ended by two old hands - Jon Thompson who presented (as he had at ACOR Seattle), an account of the nomadic people of Persia, beautifully illustrated with photographs by the marvellous Iranian photographer Nasrollah Kasraian, and Harald Böhmer, who present an account of a recent visit to the Hakkari Kurdish region of eastern Anatolia. 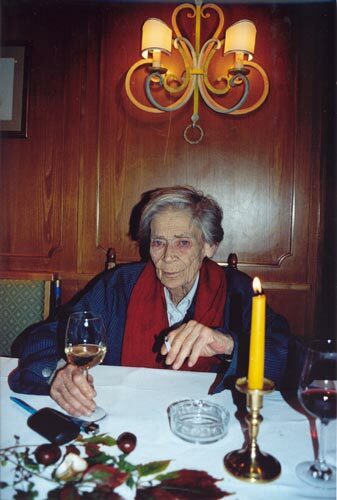 As always, the Treffen was well attended, impeccably organised, and a thorough congenial and instructive event.